• Turn Signals: Why Give Up the Element of Surprise? • Tailgating: How Close Is Not Close Enough? • Motorcycles: Faster, Cooler, Safer! 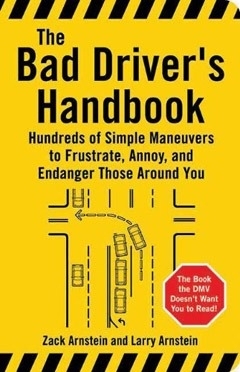 You’ll also find exhaustive lists of “Did You Knows?” (“Did you know if you get boxed in by other, smaller cars in a parking space, you have a legal right to smash into them, and bash your way free?”); Definitions (Pedestrian: “Annoying obstacle infringing upon your right to drive at the speed you feel most comfortable”); and Safety Tips (“When challenging another driver to a race at a traffic light, be sure to wait until the light has almost turned green before mashing the accelerator to the floor”). Hidden meanings behind ordinary traffic signs are revealed, including the coyly worded No U-turn sign, which actually means look both ways for police officers, and if you don’t see any, go ahead and make the U-turn! The co-author of The Ultimate Counterterrorist Home Companion, The Bad Driver’s Handbook, and The Dog Ate My Resume has recently graduated from college with no idea what he’ll do with his life. This means he has plenty of time to tell you what you should do with yours. Also having not yet made any major life decisions, he has not yet made any major mistakes. He is currently working on his resumé. The co-author of The Ultimate Counterterrorist Home Companion, The Bad Driver’s Handbook, and The Dog Ate My Resume squandered a perfectly good college education by becoming a writer for such TV shows as Saturday Night Live and Not Necessarily the News, for which he has won two Writers Guild of America awards. He is currently avoiding useful activity as one of the three writer/editors of Ironictimes.com, an online satirical weekly. He encourages young writers to pursue their dreams, but also to learn a more dependable trade, like armed robbery.